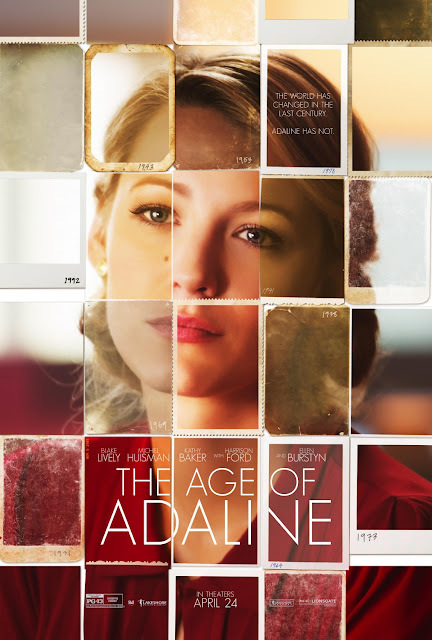 Movie: "The Age of Adaline"
In the 1930's, 29 year old Adaline Bowman (Blake Lively) is involved in a car accident when it begins to snow in Sonoma County, CA. After she stops breathing, lightning strikes her and under some very specific circumstances, this renders her immortal. Over the next 80 years, she has been forced to take on a new identity every decade to match her youthful appearance out of fear of becoming a test subject. This leaves her unable to have any lasting relationships or friendships apart from her dog. On New Years eve in 2014, Adaline meets a wealthy philanthropist named Ellis Jones (Michiel Huisman), who is infatuated with her and despite Adaline's reluctance, manages to start a relationship with her. When Ellis bring Adaline to the country to meet his parents, his father William (Harrison Ford) turns out to be a face from Adaline's past and it makes her second guess her relationship with Ellis. "The Age of Adaline" is a romantic drama with a little sci-fi fantasy twist, and this crossing of genres is sort of reminiscent of 2014's "About Time," though it's not the same premise. This movie was peddled and pushed hard as its trailer was shown attached to what seems like just about every movie debuting between the end of January through the end of April. In fact, it was played so much that I could almost recite it word for word. 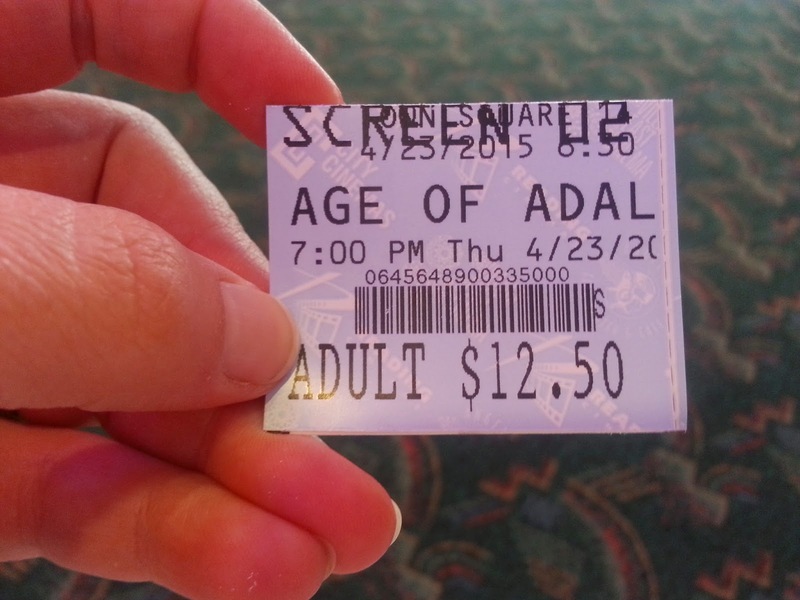 Based on the premise, we sort of thought the film would take us through the ages of Adaline's life decade by decade, but that isn't what happens. About 90% of the movie takes place in the present time, and much of that time is focused on the relationship between Adaline and Ellis, while flashbacks of her life play throughout its run time. The entire movie also includes voice overs done by Hugh Ross that seem to intentionally sound like a 1950's educational film and are used to only briefly develop Adaline and her condition. Off the bat, the movie tries to give a scientific explanation of how Adaline becomes immortal rather than simply leaving it to magic. Instead, their rationale requires a lot of suspension of disbelief and throws out many big, educational terms about a science that won't be discovered until 2035 to divulge how she is the way she is, which might feels like a cop-out to some, but isn't wholly distracting since this is a sci-fi fantasy hybrid of sorts. If you can get past this initial explanation of what you're about to see, chances are, you might not hate this movie. The only other important flashbacks are of Adaline initially running away from law enforcement officers, who have questions about her license and need to subsequently interrogate her about her looks and age, as well as brief moments to show a young William, played by Anthony Ingruber, and his past relationship with Adaline. We're not sure if his voice is altered or dubbed, but Anthony Ingruber and this movie's filmmakers certainly try their best to make him sound and look like a young Harrison Ford. In fact, there were glances of his character from afar and we could have sworn they were digital renderings of Ford himself. Blake Lively fills the role of Adaline Bowman and she plays her in a way where she has this regal, upper-crust stiffness about her. We do believe this is intentional as it makes her have a 1930's or 1940's "ladylike" style of diction and presentation from there era where Adaline was from, though this is dropped here and there in the present time. I personally didn't mind Lively in this role and I have had a problem with her acting in the past, so it was nice to see her come out of her shell a little bit and play this role so well. Michiel Huisman plays her love interest Ellis Jones, who is a tall, strong, handsome, wealthy, generous, kind and forgiving man, pretty much the ideal partner in a Hollywood fantasy, and it only took just over a century to find that perfect, flawless person. But, therein lies the problem for our heroine: being with Ellis would mean watching him grow old and though they would be together, he would eventually die, all while she doesn't age a day. This is the same problem that has kept Adaline from ever having a relationship in her very long life. The knowledge of an impending loss would be too difficult to overcome. To devote herself to someone she knows she will eventually lose all while she remains the same would be heartbreak. The conflict arises from her decision to either accept love and face that eventual loss, or spend an eternity doing little more than going through the motions of life, rather than really living life. Lively and Huisman, in my opinion, had great, tender chemistry with one another, but really, who wouldn't want to hold on to a guy like him? Lively and Harrison Ford also had some powerful chemistry upon their encounters. Though not a perfect story, "The Age of Adaline" is not horrible to watch and is much, much better than most of the romantic snooze-fests that come out each year. It remained charming throughout and had just enough of a compelling romance to keep audiences interested. One year ago, we were watching: "Bad Words"